Step 1. Use quality silver polish (such as Hagerty's Silver Polish or 3M Anti-Tarnish Silver Polish. Hagerty's Fork Cleaner is suitable for removing the tarnish on fork times only. It makes it less likely you will stab yourself polishing the fork tines. Step 2. Wear rubber gloves. Use a soft cloth for applying the silver polish and rub vigorous with this lotion cloth each and every piece. Make-up pads work very well to apply the polish without scratching your silver. This is very messy process. Step 3. Rub and polish the silver with a clean soft cloth (or make-up pad) to remove most of the silver polish. Essentially this is "polishing" your silver. Step 4. Wash all silver that will come into contact with food. Examples include flatware, silver bowls, silver trays, a sugar or creamer. Use hot soapy water with dishwashing detergent (NOT dishwasher detergent) and soft sponge. Rinse. Dry on a towel. Then I dry and buff each piece again with a soft, well worn kitchen towel to make sure that every fork, knife, spoon or silver item is clean and dry before putting it away. Step 5. Store flatware in a silver box, or drawer liner. Another inexpensive option is to include paper Hagerty’s Silver Protection Strips in a closed drawer or cabinet to prevent oxidation. Clean silver can wait ready for the next special occasion or every day. Have your silver professionally polished. I can do a much better job polishing silver than you can do at home. Each piece of flatware or hollowware is polished one at a time with a buffing machine. The polishing wheel is rotating at 2750/5,000 RPM. A buffing compound is applied to the buffing wheel. This is a huge amount of hard, dirty work. Never try this at home. This is not a D.I.Y. activity. The polishing wheel can literally pull the object right out of your hand. Safety glasses and a dust mask are a minimum for protection. Do not use aluminum foil "recipes" to remove tarnish. These types of products remove the dark oxidation in the silver pattern. These dips leave a white frosty appearance without polishing. How Can I Prevent Tarnish on My Silver? Sterling silver and silverplate will always tarnish, but there are a number of wasy to reduce or slow the oxidation. Hagerty Silver Protection Strips or 3M Silver Protector Strips work well in a closed cabinet, case or drawer. Place them in a glass display cabinet with your silver and the amount of time between polishing will be significantly reduced. A tarnish prevention strip doesn't last forever. I add a new strip every 6 months or so. Writing the date on the back of the paper strip helps you remember how long it has been since it was replaced. I do not recommend lacquering silver to prevent tarnish. Over time the lacquer yellows and discolors, then your silver no longer has the glimering sparkle of silver. In addition, even the smallest scratch in the lacquer allows the silver to tarnish. So then, you have dark scratches of oxidized silver, combined with yellowish areas. Not an attractive combination in my opinion. Another problem is that when silver is lacquered you can not polish it yourself. If your silver is lacquered, and looks poorly as I described above, I can remove the lacquer and polish your silver for you. Hagerty Silversmith Polish and 3M Tarni-Shield Polish both prevent tarnish for items on display. Every time you use your silver, it has to be reapplied for the tarnish preventive property's. Items for display only can be polished and then micro-crystalline Renaissance Wax can be applied. Renaissance Wax is used by museums for their silver on display. It does not hurt your silver, and your silver can be used any time. However, after use the Renaissance Wax would have to be reapplied. Applying the Renaissance Wax is easy, but takes time. This is why I only recommend it for silver on display. Just apply the wax with a soft rag, cotton ball, or make-up pad. As soon as it starts to dry, rub off the matte waxy appearance with a clean soft cloth or make-up pad. Buy the small container of Renaissance Wax (65 ml) as it lasts a long time . The large container of Renaissance Wax (200 ml) would be suitable if you were going to use this for a large collection or larger items. Renaissance Wax can also be used for brass, bronze, marble, etc. Renaissance Wax does not completely eliminate tarnish, but slows down the oxidation considerably. Any time you want to polish your items, just polish and reapply the wax. Store silver hollowware in treated silver cloth bags. Making your own bags is the most economical and effective storage method lasting at least 20 years or longer. Hagerty Silvercloth Bags come in a variety of sizes to protect your silver from tarnish. 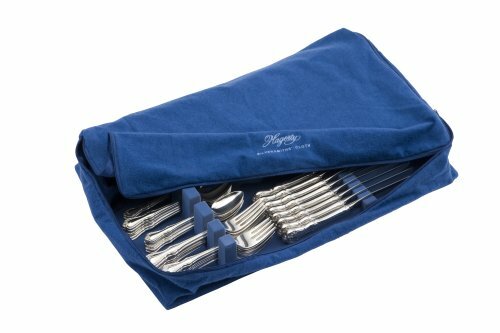 Store silver flatware (forks, knives and spoons) in a Hagerty zippered silver cloth drawer liner. This fits conveniently in a drawer but keeps your flatware accessible. NEVER store sterling silver or silver plate in Saran Wrap, plastic bags, bubble wrap or use rubber bands. These materials "outgas" leaving permanent marks and permanently ruin silver plating. The least expensive option storage option is Ziploc® polyethylene bag bags with either 3M Silver Protection Strips or Hagerty Silver Protection Strips in the Ziploc® bag. The Hagerty Silver Protection Strips also work in a closed cabinet that displays your silver. After using your sterling silver or silverplate teapot or coffeepot it is important to dry the inside completely before storage. Turn upside down (and prop it up) so any remaining water can drain through the spout. Let it stand upside down over night before putting it away. See the image (right) as an example.